Happy Saturday my design devotees! I apologize for being a little tardy in getting posts up on the blog lately. Besides being a full time designer & being 8 1/2 months pregnant, I’m also in the midst of a really fun project. It’s not a client project. It’s a new home for our family! We are beyond excited & can’t wait to get settled into it. We really weren’t even looking. We just sort of happened upon this house right before Thanksgiving & felt that it was a great investment for our family. So, we jumped on it! We closed on it right before Christmas, so for the past month we have been making some changes to make it fit our taste & lifestyle. We are just a few weeks away from moving in & it’s all starting to come together. I have lots of fun photos & info to share with you documenting our renovation. Today I will leave you with a sneak peek at what’s going on in the kitchen. Before: The kitchen was REALLY dark. 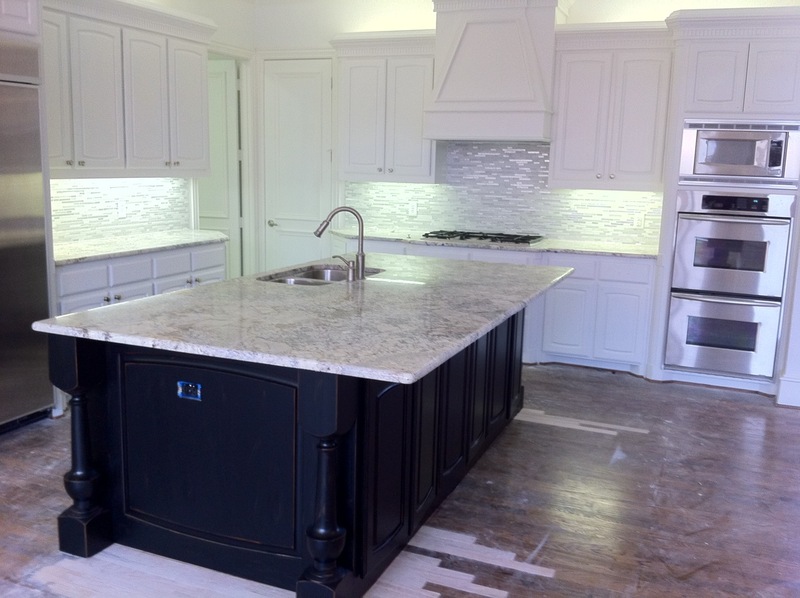 Dark trim, dark floors, dark cabinets. The island did not work well for us at all. So, it had to go! It was small & it went from counter to bar height. We entertain a lot & really wanted a large island that was all counter height. The sink is also in the island which takes up a lot of space. I took this photo yesterday. The transformation is taking shape! I wanted a light & fresh feeling for the kitchen. I painted the kitchen cabinets & all of the crown molding & baseboards Benjamin Moore Cloud White. I painted the ceiling Benjamin Moore White Herron. This gave the space an instant face lift! I selected a light granite with lots of movement. It has white, cream ,black, gray & a bit of gold veins running through it. The backsplash is a a mixture of carrera marble and glass tiles lined in a silver foil. 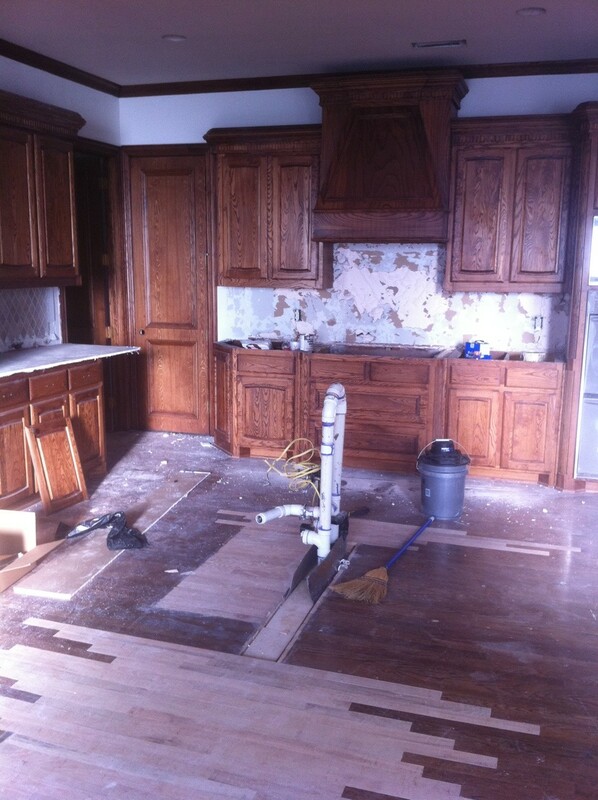 All of our hardware is chrome & I will be putting a stunning antique mirror & chrome chandelier over the island. I LOVE my new island! It is 107″ by 60″. Perfect for entertaining & cooking! We antiqued it & the entertainment built ins in the family room in black for a pop of contrast. The wood floors will be getting scraped & stained a deeper darker brown on Monday. I can’t wait to show you my fabric & furniture plans for the kitchen, nook & family room areas! For daily updates, you can always follow me on twitter. I’ve got lots more to show you, so stay tuned! Have a fabulous weekend everyone!